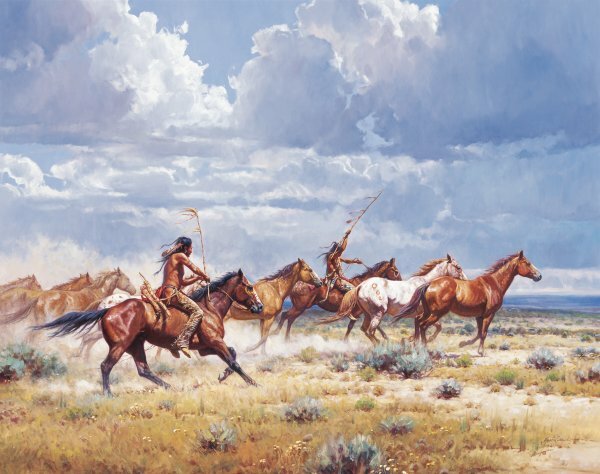 "In his book, 'No More Buffalo', Bob Scriver tells with a fictional story how the Blackfeet described the first horse that they saw. Some said it looked like the elk, being about the same size and color, and others had seen it in distant Indian camps being used to pull the travois - like the dogs that were used by the Blackfeet. So, according to the story, they called them 'Ponokah-Eemetah' in their language, which translates to Elk-Dog in English. "I have tried in the painting to celebrate the freedom and excitement of 'Running with the Elk-Dogs'."